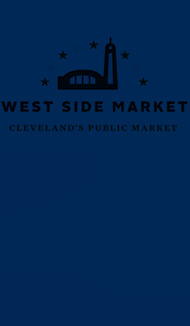 Our stands at the West Side Market are the one and only location where you will find us. 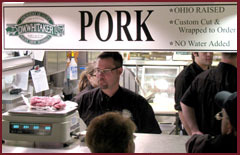 If you are familiar with the Market, you know that there are many other different vendors selling pork, poultry, and deli meats. It is this competition which motivates us to be our best. Our first goal is to be here for you when you are counting on us, and to be fully stocked with the variety of products you expect. This might sound like something most people would take for granted, but we understand how frustrating it can be to shop at a place with unreliable hours or questionable inventory availability. Our second goal is to provide the freshest products. Fresh deliveries arrive every day, and our staff constantly monitors our product quality. We demand freshness, and we will offer to you only what is good enough to serve to our own families. Our third goal is to offer you service that is second-to-none. Our full-time staff of meat cutters and clerks will offer you advice on picking the best cuts to fit your needs. We'll separate and wrap your order to your exact specifications, saving you time and money. And you can count on seeing familiar faces behind the counter, courteous people who care about your needs. "We are looking beyond today. We want to build a long term relationship with our customers." Thank you for considering D.W. Whitaker Meats. We want to be the best. Please share your feedback with us.